You'll be £40.00 closer to your next £10.00 credit when you purchase British Warship Recognition: The Perkins Identification Albums, Volume I. What's this? In the inter-war years Richard Perkins, a keen amateur photographer and avid collector, amassed one of the world’s largest personal collections of warship negatives. This he eventually bequeathed to the National Maritime Museum, where it still forms the core of the historic photos naval section. While he was actively acquiring photos, he found that many were neither identified nor accurately dated, so he began to compile an album of his own drawings, which incorporated as much detail as possible on individual ships that could be amended as he discovered more information. His main concentration was on features differentiating ships of the same class and, wherever possible, precisely dating alterations to their appearance, all portrayed in exquisite multi-coloured annotated line drawings. This project grew into an enormous resource covering virtually every Royal Navy ship from 1860 to 1939, when security restrictions forced Perkins to stop work. This material was also donated to the NMM, where it was bound into eight large folio volumes that became a key reference for the curators of historic photos, but unknown and almost inaccessible to the interested public. This makes this first publication an event of the utmost importance for every enthusiast and ship modeller – it reproduces all the drawings at full size and in colour, and will eventually form a multi-volume set of unique reference value. ... well worth a place of pride on any coffee table or bookshelf. I especially recommend these books for those who are interested in the Royal Navy 1870-1939, and anybody who enjoys studying the minutiae of warship design, fittings and decorations. ... For some the price will undoubtedly be a deterrent to purchase, but for photograph collectors, modellers, and anyone else interested in the development and appearance of Royal Navy warships during the period the books are likely to be regarded as indispensable. All-in-all, this superb volume exceeded all my expectations with the quality of the reproduction of the beautiful drawings being truly excellent. Despite its cost this magnificent book represents good value for money and will be a valuable addition to the bookshelf of any naval enthusiast. Highly recommended. This is one of the most remarkable books to come my way for a long time. This is one of the most remarkable books to come my way for a long time. It is the first of eight volumes of facsimiles of elegant water-coloured line drawings of British naval vessels from Victorian times to 1939. Each is annotated in manuscript and is often adumbrated with sketches of various detailed changes to appearance over successive refits. This first volume covers the core of the Fleet - battleships and battlecruisers – from 1895 and concludes in 1939 with HMSs Rodney and Nelson; the sequence is Dreadnought and later battleships, battlecruisers, and lastly a section on pre-dreadnoughts going back to ca.1895. The capital ship story of course would complete with the KGVs and Vanguard, but from 1939 casual photography of military subjects presented problems. Something over 90 ships are represented, in broadside elevation, mostly individually and usually with several successive representations, in approximately 160 pages of elegant drawings. There are, for instance, five depictions of HMS Hood. Masts are adapted, bridge structures are altered, funnel cowls, torpedo nets and their booms come and go – each change is meticulously noted. Note that with generally details of armament etc. are not included except where changes affect external appearance – you have to go to Jane's for that and for internal details such as propulsion. The focus and indeed the stated intent is to provide an aid to the recognition and dating of historic photographs of British warships, and indeed the originals have been used for just that in the NMM. Little is known of the author as a person. After decades of remarkable research going back at least from the 1920s he gave his archive of drawings and thousands of photographic negatives to the NMM in 1967. The originals were carefully sorted and bound by the NMM and have now been photographed in high resolution for this published edition which contains two hundred pages of detailed illustrations. Seaforth are to be congratulated for bringing to the public this extraordinary gem from the NMM's otherwise unseen treasure house, and for doing so in such an elegant style. This is more than a key work of reference, or even a key contribution to naval history - it's a work of art. This is not a book for those looking for the full history, technical details or careers of the RN battleships and battlecruisers 1895 to 1939. It is, as the title clearly indicates, a very, very comprehensive guide purely intended for the identification of individual ships by period . The full profile sketches and additional detail views of mast, rigging, funnels etc and Perkins notes go a very long way to identifying a ship from elderly relatives' snapshots , and poorly and often incorrectly captioned published photos. All in very subtle watercolours and ink. You can also use it to supplement other works for the detailed alterations to individual ships but this is not its primary purpose. Although very useful for that. Perkins' drawings are superb, and easy, in this well reproduced volume, to use and interpret. Further notes by the National Maritime Museum Staff have been judiciously appended in places . I think I recognise George Osbourne's script ! One nice feature is that all pages and opposing pages have the ship profiles going the same way. (Malcolm George Wright please note). Bows right until page 106, when for some indiscernible reason Perkins had them going back the other way , bows to the left . No plan views .. Very highly recommended if you want it for its original purpose. But you should not chose as your first or even second book on British Battleships. Unless the sheer beauty of the illustrations captivate you ! 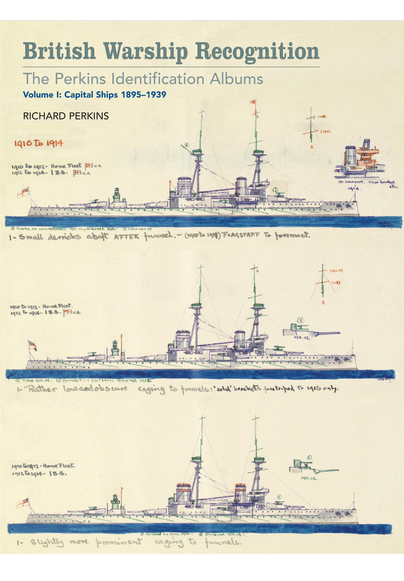 Richard Perkins collected over 11,000 British warship photographs and, in order to recognise individual ships at different stages of their careers, he also created over 5,000 superbly detailed profile recognition drawings covering the period from 1895 to 1939. Subsequent security constraints stopped him from continuing and this book covers ships from the majestic class of 1895 to Rodeny and Nelson after 1927. King George V class ships were not included as the first was not completed until 1940. The result was an invaluable resource which was donated to the National Maritime Museum in 1967 when Perkins retired and moved into a smaller house which had insufficient space for its continued storage. He died in 1985. The original drawings were on loose sheets which were bound into books by the museum and this volume contains all the battleships and battlecruisers. Further volumes are in preparation, cruisers and aircraft-carrying ships are due next, which are to contain the remaining warship types. As well as a recognition guide, Volume 1 is an attractive work of art. The subject ships are arranged by type and class with individual ships' alterations and modified features colour-coded and described in notes. Separate drawings show ships at different stages of their careers allowing readers to follow gradual changes in their appearance. The Perkins Collection has provided staff at the NMM with an unrivalled source of information and it has to be considered the most thorough and comprehensive work of its kind ever created by a single individual. To create a facsimile of it, the museum's experts photographed the drawings digitally to a very high resolution and worked closely with Seaforth Publishing to produce exact replicas of the original drawings with regard to colour quality, page size and arrangement. Undeniably large at 16 by 12 inches and with a UK recommended price tag of £50.00 it is not cheap but many of its 175 pages contain two, three or even four ship drawings and there are a wealth of detail drawings and notes giving everyone access to the collection without having to travel to Woolwich to see the original in the NMM's archive in the 'Brass Foundry'. I thoroughly recommend it to anyone with an interest in the British warships of this period. A masterpiece of incalculable value without which today we could have information of countless warships sailed the seas. This amazing volume is not simply about British warship recognition; it will be of untold benefit and interest to anyone with an interest in such vessels, including model makers and miniaturists, together with historians and archivists. Richard Perkins, who took the original photographs, left his collection to the country, and Pen and Sword have taken the opportunity to bring it in printed form to the general public for the very first time. We are promised further volumes in this amazing collection. Superb. ...The Perkins Collection has provided the staff of the National Maritime Museum with an unparalleled source of information and it must be considered the most thorough and comprehensive work of its kind ever created by a single individual. The museum’s own staff photographed the drawings digitally to a very high resolution and worked closely with Seaforth Publishing to produce an exact facsimile of the original drawings in colour quality, page size and arrangement. Both deserve praise for their work. The book is large at 31 by 40 cm and with a UK recommended price tag of £50.00 it is not cheap. However, it has 175 pages most of which contain two, three or even four ship drawings and there are numerous detail drawings and notes. It really is an outstanding reference work which gives everyone the opportunity to own a facsimile of this unique collection. My review copy has taken a valued place on my bookshelf and I thoroughly recommend it to anyone with an interest in British battleship and battlecruiser development during the period in question. This beautifully produced, large format book consists of many coloured drawings of British warship profiles. They show only the external features of the ships, as seen from a considerable distance, to enable the observer to identify the ship. How do I review a book like this? Short answer is I can’t. Mr Perkins’ work is outstanding and the drawings and notes are things of charm and beauty. As individual images they would be valuable framed prints. As complete books they are priceless, the sort of stuff that turns up on the Antiques Roadshow and makes grown men sigh. But you only have to look at these books to see this for yourself. You don’t need a third party to tell you. So what can I do? I can tell you these books are not cheap and they are certainly not small. They will undoubtedly appeal to a niche market – the sort of people who will be able to find errors (if any) – and the lovers of maritime art. I don’t know what the general reader would take from them. Regardless of this the book brings me out in a big cheesy grin. Richard Perkins may have been something of an obsessive, but he also had vision. He was meticulous in his planning and cataloguing of modifications to specific ships and he had the sense to record all the details using a fairly easy to follow system. He did it all for himself, but now it his masterpiece is available to us. Blokes like lists and, in effect, that is what these books are, albeit with colour drawings. The work is unique and, by virtue of its accuracy, authority, and the sheer volume of detail, fills a very important gap in British naval history. On a Rating Scale (where 1 is very poor, 10: excellent): I would give this book a 9. The scans of Volume 1 of the Perkins Albums has been exquisitely reproduced to the exact sizing and color of the original illustrations allowing the reader an amazing viewing experience similar to seeing them in person; better in one sense that anyone can now have this valuable resourcing information in their own personal library. The Perkins illustrations are meticulously drawn and beautifully categorized allowing anyone searching for specific information about any particular ship or class of chip, ease in locating the information quickly. ...Hands down, you will not find a better ship recognition guide anywhere else. Whether you are a career researcher or the casual enthusiast of naval subjects and especially modellers looking for accuracy to what was in place on these ships, this first volume of The Perkins Identification Albums is a must have for your collection! Every so often there comes along a book that is so seminal that no library is complete without it. A book that becomes that one stop, go to, reference tool that you cannot do without. For collectors, modelers, and students of the Royal Navy, this is it. ...I have been collecting books on naval subjects for nearly 60 years, and have a library of over 1,600 volumes, including nearly all the important works published on British battleships, yet I have rarely found one book so extensively and comprehensively devoted to one vital subject. Don't wait. Order one from Seaforth now. This large new hardback book from Seaforth Publishing is, I think, something rather special. This is the first of 8 volumes of these and is simply a set of high quality images that capture the original pages of a series of profiles and sketches, along with hand written notes done of many years by Richard Perkins, who donated his collection to the National Maritime Museum, along with many original photographs, before his death in 1985. A real gem for any enthusiast of an era when the Royal Navy did 'Rule the Waves' and if you examine period photos, an unrivalled reference. Seaforth is a Pen & Sword imprint with an impeccable reputation in bringing to market outstanding naval history. This new book will only add to the reputation. Working with the National Maritime Museum, Seaforth has produced the first in a multi-volume series, using the epic work of Richard Perkins. This work was based on Perkins huge library of photographs of warships and was ended only by the outbreak of World War Two and the restrictions imposed for security reasons. Volume I covers Capital Ships from 1895-1939. This work will be of great importance to all professionals and enthusiasts with an interest in this significant period of naval history. The book does include some fine monochrome photographs, but its joy and strength is a collection of waterline drawings, many coloured, depicting the British Capital Ships of the period by Class. Most drawings include hand-written notes and these drawings are followed by detailed drawings of key identification points between warships within class, such as masts and funnels. The publisher has spared no expense in production and this is consequently a large format book that employs heavy gloss paper. The author's work has been reproduced extremely well and there are very few books that show this much attention to detail.